Random Rants | CAVE Momma! Rants about Primal-Paleo Lifestyle and why it’s so important. Are we making our children sick and crazy? I was walking through the grocery store the other day with my youngest daughter. We walked through the middle aisle to get to the back of the store, and she saw the “Kool-aide Man” on the side of a pack of ‘juice’ boxes. She stopped, pointed, and said, “mommy, why can’t I have purple juice boxes like my friend?” I asked if she didn’t like the water bottle anymore. She said, “no, I like water, but I would like to have purple juice.” “It is bad for your body, Kris” was my reply. “Where would you find purple in nature?” She looked at me thoughtfully for a few seconds and said “Grapes?” I agreed, then we read the side of the box together. “Did you hear mommy say grapes?” She said she did not, and asked me what HFCS is. I explained the best I could, but we agreed that those things we can barely pronounce are not things we want to put into our bodies. “That had lots of greedience, too mom. 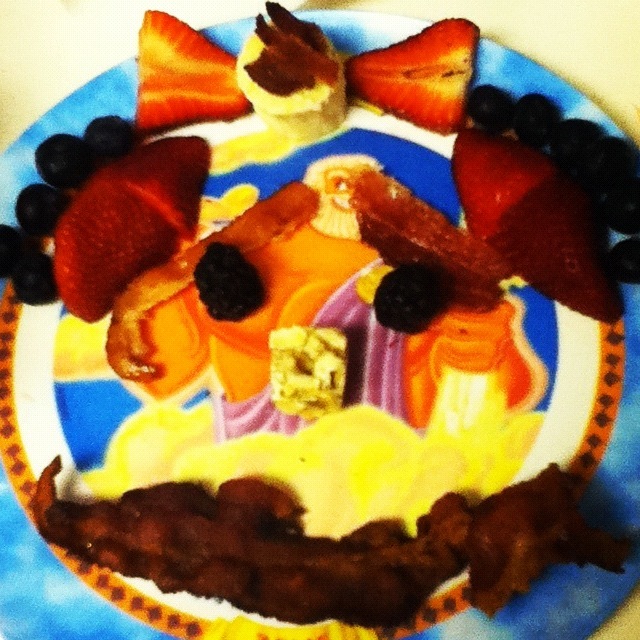 We only eat things with one or two greedience”. This satisfied her, and we moved on. My mind, of course had just begun racing. I asked her to show me what else her friends brought in their lunchboxes, and she was more than happy to lead me up and down the aisles pointing and explaining. My stomach started turning, my eyes welled up with tears. As I was reading the boxes, I could totally see why parents would feed this stuff to their kids. It’s easy, cheap, and hey, it says “made with real fruit” or “lower sugar” or “”made with whole grain! Low fat! 10 essential vitamins and minerals!” One example of this craptastic marketing is General Mills Fruit Rollups (TM). Check out the ingredients on these babies. More like “corn syrup food coloring chemical sh*tstorm Rollups”. UGH. This set into motion my asking the kids to give me a full report of what their friends ate and drank day to day. I gathered information from as many people as I could, then began doing nutrition information research. I also asked questions about their grades, relationships, skin, hair, and behavior. The results are staggering. One mom, a patient of mine, said that she had “no idea that cereal was bad for you! I feed that to them for breakfast and snacks!” She is diabetic. Her children are headed there too. It seems to be an endless cycle. 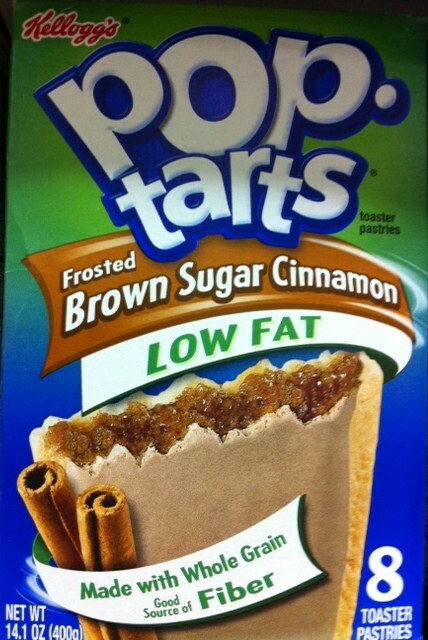 Breakfast: Pop-tarts (Note: there are 2 in each package. Nutrition info is for 1.) Assuming this child only eats one, He’s already consumed 37 g of carbs (28% of the daily recommended) and 15 grams of sugar (2.5 times his daily intake. at 7 am. ), and only 2 grams of muscle-building protein. His pancreas works hard to release enough insulin to get the glucose under control, and by 9 am, CRASH. He’s grouchy, shaky, hungry and ready for a snack. Good thing it’s snack time! Snack: Granola Bars! Super healthy whole grain snack! 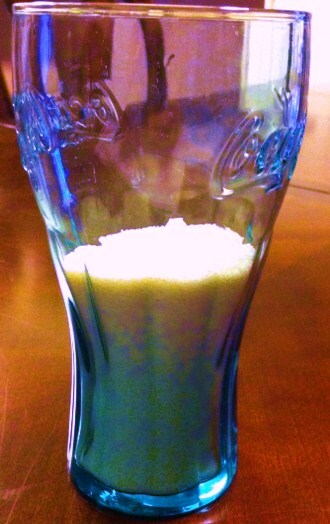 29 carbs, another 12 grams of sugar, and 4 grams of protein. SWEET. Another round of insulin release, sugar high, and another crash…right at LUNCHTIME! Lunch: Peanut butter and Jelly Sandwich, Apple, Fruit Gushers, chips, and a Capri-Sun. Assuming it’s whole wheat bread (That’s an argument for a later post), it totals approximately 122 g carbs, 63 g sugars, and 13 g protein. HOLY BLOOD SUGAR, BATMAN. Have you been doing your arithmetic? So far, We’re at 188 g carbs, 90 g sugars, and a whopping 19 grams of protein. How many artificial colors and dyes were in those gushers? EEEEK. You could not pay me enough to be a teacher. It’s not the kid’s fault. He is just eating what is given to him, and reacting the way his body is telling him to based on crazy ups and downs and metabolic processes. The child doesn’t want to be a trouble maker, but he just cannot sit still. He’s pissy, but doesn’t know why. Another Crash. Must be.. Afternoon Snacktime! : Goldfish crackers. Well, the good news is these are pretty low in sugar and have a moderate amount of protein. They do, however, pack in the carbohydrates at 20 g, and are full of processed flours and commercial (read: inflammatory) oils. Holy moly, that’s a whole other blog. We haven’t even sniffed dinner, and we are over 200 g carbohydrate and 92 g sugar for the day. Dinner time comes, and tonight they’re having Spaghetti, garlic bread, and a side salad. Woo hoo, a vegetable. Iceberg lettuce (zero nutritional value), cucumber (same), some carrots, and commercial salad dressing (we’ll go with Italian). 1 cup noodles, half cup Sauce, 2 tbsp dressing. Can of soda.. Carbohydrate count for dinner: 113grams. 54 g sugar, and 13 grams of protein. If there was meat added to the sauce, add in 20 grams of protein. At least we’re getting that in. Assuming we don’t eat dessert, snacks, etc for the rest of the night, he has eaten 321 grams of carbohydrates (skyrocketing his blood sugar in huge waves), 146 grams of sugar. ONE HUNDRED FORTY SIX. I’ll wait while you scroll back to the top to remember how many a child is supposed to have. This is almost 25 times the amount this child was supposed to have for the day, the equivalent of 34 teaspoons of sugar. The amount of sugar kids are getting every day. 34 teaspoons. Too extreme? I wish it were. This is data from personal sources. Let’s go with Example 2. Breakfast is a bowl of cereal (Honey nut gluten free Chex) with Lowfat milk and a glass of 100% orange juice. Hell, let’s go all kinds of health-nut crazy and say Soy milk. (For the record, Soy milk is HORRIBLE FOR YOU..but I digress…) For snack, sally brings a Nutrigrain Bar. Lunch is a turkey and cheese sandwich on whole wheat, strawberry yogurt, an apple, and a fruit rollup with organic chocolate milk. Afternoon snack is a cheese and peanut butter cracker packet and a 100% juice box. Dinner is Meatloaf, corn, mashed potatoes, a roll, and 2% milk. Total carbohydrates: 304. Sugars: 132 Protein: 46. Still no real vegetables, rarely any plain water, all processed food. Tons of peaks and valleys in the blood sugar/insulin department. The kids in these examples are the ones struggling with school work, emotional issues, skin problems, and some are on medications already to control their behavior or health. yikes. I am not for one moment suggesting parents would intentionally harm their children for the sake of convenience. We have been beaten and badgered by ads, brightly colored packaging, and misinformation for years. Kids want things that look awesome and that cartoon characters say is good for them. Once they are hooked on the sugar, it is a downward spiral. No parent wants to fight with their child at every meal and snack time. It’s not fun to be the bad guy. I’m telling you right now: they are worth it. They WILL be OK. In fact, they’ll be SO MUCH BETTER. 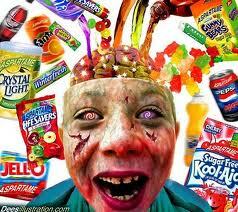 Sugar overdose causes behavior issues, ADD/ADHD, tooth decay, insomnia, diabetes, and daytime sluggishness. There are studies that prove artificial colors can be a contributing factor to ADHD. Real, nutrient dense foods do not have these side effects. Here’s what a Cavekid eats on the daily. I give them options, but all clean, healthy options. Lunch: Turkey lunchmeat (Boar’s head or applegate with no fillers or nitrates) wrapped around a piece of cheese, organic baby carrots, celery with almond butter, and a fruit (usually grapes or banana). Sometimes Gluten free Kettle chips. Dinner: Seared pork, salad, sweet potato. or Meatballs over spaghetti squash. Dessert: Not often. Sometimes a bowl of fruit, or some homemade cave-treat. My kids drink water. all day. every day. I haven’t given them fruit juices or sodas, and they don’t ever ask. Totals: 128-135 g carbs, 36-40 g sugar (all from whole fruits/veg), and 48-60 g protein. They also get adequate amounts of fat for brain growth as I cook in grassfed butter or organic coconut oil. 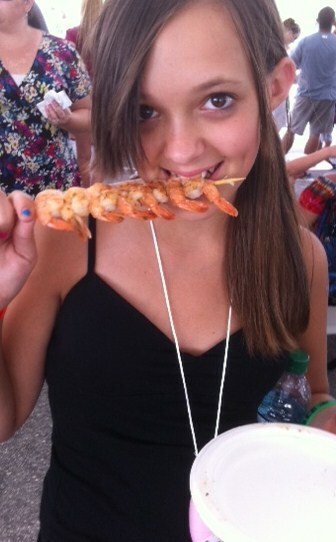 KaLynn loves her shrimp on the barbie! WOW! That went SO much faster than expected. I have a lot to tell you! This is the first time I’ve gotten through 30 whole days, no Paleo “treats”, no cheat days, nothing. Pure, perfect, clean eating. That is such an amazing victory, especially since I have had MANY dangerous opportunities to give in “just this once”. Brownie-weilding drug reps, company lunches, birthday parties…all the things I used to use as excuses…”I’ll start over after (insert ‘special’ occasion here)”. After this month, all I can think is, “why?” This isn’t some diet you go on and off. Vegans don’t eat meat “just this once”. People with peanut allergies don’t indulge in vats of peanut butter for just this one birthday party. Why the hell would I eat something, even just once, that I know will lead to bloating, stomach pain, and self-loathing? I won’t. That’s the greatest thing that has come of this month. I have learned my relationship with food was a crazy one, and I’m ready and ABLE to jump off that train. I have fingernails-and I didn’t have to pay for them. I grew them all by myself. :O) This is a first for me and I’m pretty darn excited about it. My skin is clear. WOW!!! I have received so many comments about how great my skin looks. I have STOPPED WASHING IT. I lay a hot wet washcloth on my face at night and in the morning, I don’t use soap at all.It isn’t perfect, but it is 99% better in just one month of eliminating grain, sugar, and dairy. I am stunned. I have learned to use one of the greatest God-given gifts: The power of self-control. This is HUGE, and it has so many effects past just food consumption. It has spilled over into my daily life in things like how I choose to react to daily situations. I could write a whole post on this….hmmmm…. Yeah, not to shabby for 30 measly days. I still think that’s beans compared to all the other amazing effects. And I don’t plan on stopping. Bring on February birthday parties, Valentine’s day and all. I’ve got this. We have had a long and difficult relationship, and we’ve been through a lot together. Arguments, fits, and hatred for each other. I believe it is time to draw the line in the sand and just move on. Enough is enough. I know you are holding me back and I am tired of it. You have come between me and my goals too many times, and it doesn’t seem to matter to you what the goal is; working out, eating nutritious food, studying to get good grades, getting up at 5am to get things done, etc. You’re always in my way. NO MORE. So, “I can’t”, this is goodbye. Because I can. and I WILL. A little preparation goes a long way! So, how do I feed a family of 6 a fully clean, paleo diet while working full-time and going to school? With a little planning, preparation, and of course, help from my cavekids 🙂 They love to be in the kitchen with me, and it’s my time to teach them to cook, talk about why certain food is healthy for our bodies, and just spend time hanging out with my favorite people. Throughout the week, I see recipes here or there on sites like fastpaleo.com, everydaypaleo.com, civilizedcavemancooking.com, and many others (all on the “likes” section of my Facebook Cavemomma page) and I bookmark them – usually because I’m really busy going between job sites, so I’ll get them together later and print them. Sunday morning, while we’re cleaning the house, I take note of what we already have in the freezer, pantry, and fridge, and begin making a meal plan from the recipes I came across mixed with some favorites of ours. After I have about 7-9 meals, I begin my grocery list, always including breakfasts, lunches, dinners, and snacks. I do NOT want to have to stop at the store every night for this or that – it’s time-consuming and expensive. We spend the day Sunday at the pool, beach, park, or just hanging out around the cave. Sunday evening, I go to 2-3 stores, depending on the week and the needs. I also stop by the local farmer’s market first for good local produce. I know this sounds awful, but if you have a plan, it truly isn’t. I make lists by store – Costco for the bulk items (mostly our business supplies, paper products, and bulk wild caught fish and chicken), then to whole foods for grassfed beef, local organic eggs and nitrate free uncured bacon, coconut milk, lunchmeat, and some on-sale organics, then SuperTarget for less expensive organics veggies and staples if need be. Sometimes I don’t need to go to Costco, and sometimes I only go to Target because it is closest and they do have a pretty great organic section where I am. Total trip: usually 2-3 hours. I can hear it now, in the worst whiny, nasal voice “but I haaaaaatttteee shooooopppiiiinnnnngggg” Yes, pumpkin, I know. Me too. But if you take the kids you can make it another fun learning experience – and mine keep me laughing and having a ball the whole time. Hey, I never said “a little prep is super easy!” I just said necessary. K? Good. All that prep gets 6 people through about Wednesday. Perfect, because Wednesday nights are youth group nights for the kids, so I get 2 hours to myself to get a good solid workout and prep for Thursday and Friday without the “help”. Saturday we eat small meals through the day and we prepare a big dinnner together or go out to eat. We have been solidly Paleo/Primal for about 2 months (We weaned into this over about 6 months), and I can tell you it gets easier every week. I notice that we eat SO many different meals now, keeping it fun and tasty instead of the same tacos, spaghetti, and meatloaf week after week. We try at least 2 new things every week and we’re having fun with it. This lifestyle has become part of us. Tradition. We’re reaping the benefits in health, learning, AND time together. Yay!! I hope this helps you and your family! Soon, it is my intention to help families meal plan and make grocery lists..so, if you need help, hit me up! It’s why I’m here! Very related to the “I can’t afford to eat healthy” and “I don’t have time to do this” is the “you just don’t understand MY life” excuse. One may be correct in saying I don’t live in their home or deal with their situation, but I have a pretty full existence. I would like to share with you a page from my book, if you’re interested. Monday morning, 5:30 am. My very calming, gentle alarm rouses me from dream state. Then, my husband’s alarm puts the local lightning alert system to shame. Ok, let’s go. Off to the kitchen, pour two cups of black coffee (which I pre-set the night before), and begin the lunch-making process. Turkey wraps made with nitrate free no-filler Boars Head turkey, shredded carrots, and hard cheese. Tupperware containers full of grapes, celery with almond butter, an apple, or whatever other Paleo-friendly treasures my children have picked out the previous evening. A water bottle in the side pockets, and 4 lunches are ready to go. Then, I pack the big people cooler full of pre-made chicken salad, organic romaine lettuce leaves, tons of water bottles, some apples and 2 large salads and olive oil on the side. Time for the herd to rise. 5:45 am: I drop off David’s coffee and gently remind him it’s time to rock and roll, which is met with “but I’m sleeeepy!” Yeah, me too kiddo. By the time I get to the girls’ room, my oldest daughter is already dressed and in the kitchen helping make breakfast. I dress the 4 year old before she wakes up to avoid a wardrobe conflict and remind the 8 year old to make her bed. As I walk into my son’s room, he grunts “yeah, mom, I’m up”. “Looks like it” I reply (this is an every morning ritual.) I throw the eggs on the table and remind the kids to rinse the dishes when they’re done and double check their rooms to make sure the beds are made and rooms are clear of dirty jammies and such. 6:00 am: I pour the remaining coffee into the to-go thermos and head toward the shower, which is currently taken by the sleepyhead. Good thing he makes the bed every morning. So, I run in and start a load of laundry and put away the clean dishes from the dishwasher and throw a roast, baby carrots, and onions in the crockpot . Gotta fly through my shower so we can be out the door by 6:40. I drop the 3 big kids off at their dad’s house where they’ll wait for the bus, then the little one across the street at her daycare. Off to clean our first couple retail stores before they open, usually 2 before 8:30. Then we run off to a construction project or our residential regulars, depending on the day. This usually includes 2-4 houses, ranging in size from 1500-5500 square feet. We work scrubbing, dusting, cleaning windows, pressure washing, and mopping all day til 3 or 5, grabbing bits of this and that out of the cooler for lunch and snacks between jobs. It’s HOT here in South Florida, so we drink gallons of water throughout the day. When we’re all finished and completely sweaty and gross, we run around collecting the kids and head home for dinner – right after we stop at Target because “I have a project for geography..due TOMORROW”. Awesome. We’re still working on that planning thing. Lunch boxes collected on the counter, everyone grabs a plate and we sit down for 20-30 minutes for dinner. (Unless, of course, I have class, then I grab a handful of whatever, maybe get a quick shower, and run out the door yelling instructions they’ve already heard a million times.) After dinner, the table is cleared, leftovers stored, kitchen cleaned, dishwasher started, coffee pre-made, and lunches set up for tomorrow. The three older kiddos get their showers and set out their uniforms for the next day and I bathe the 4-year-old. Tonight, all three girls need their hair braided for tomorrow. Oh, wait, no, the 8-year-old wants a blow dry and straighten, the other two want braids. Oh, and can you paint my nails, mommy? Of course. Right after I switch the laundry. Hey Zac, dryer’s done. Fold it and put it away 🙂 KaLynn, while I dry Alyssa’s hair, I need you to run the vacuum around the table and get whatever that is on your bedroom floor while you’re at it. At around 8pm, I read the littlest ones a book, the rooms are cleaned up, and we get ready for bed. This is where I’ll get to the gym some nights, for about 45 minutes. Lights out for the littles at 9:15. Then I sit down to check my email, Facebook, and blog before catching up our business and personal books, send invoices and estimates, and reconcile accounts. David is busy checking on our stocks, making sure the fluids in the cars and work van are good, doing our business scheduling, returning business calls and emails, and if I’m at school, doing everything else. Thank God for him. Now, there are days that vary. Some days, we start by 6 am and are finished by 1, giving me time to do the books and get a workout in there before getting the kids. Some days, there is no working out at all, because I have class, Zac has hockey, the girls have gymnastics, there’s a band concert, or I have to study for an exam, But there is very rarely a day we don’t eat to fuel our bodies correctly. Could you imagine keeping up with 6 people if I weren’t properly fueled? I have tried it, and I don’t recommend it. We try to be in bed by 10 most nights, because I recognize the value of sleep. Trust me, NO ONE wants to deal with me if I have fewer than 7 hours. Our room is completely dark and cool, and we rest well. This is vital to a healthy life. I repeat: VITAL. So, what’s my point? My point is, I have 4 kids. I own a business, go to school, have kids in extracurricular activities, work out, and still manage to feed my family 95% Paleo nutrition. I see my family as a REASON, instead of an excuse. I do not watch TV, because I feel it’s a mindless waste of precious time. I like to spend time with my family at the dinner table, on the weekends at the pool or park, or the beach. If you haven’t read my earlier blog about my very skeptical-about-paleo younger brother, Aaron, I encourage you to go do that now. I’ll wait……NO? Ok, I’ll repost it. Along with his 30 day update. Ummm…WOW. So, I asked Sarah to write me and tell me how it was going in her eyes. That was 30 days ago. Last night, I spoke to him again. He told me he emailed me the 30 day update pictures a day early because he just couldn’t wait. Mind you, he wasn’t extremely overweight to begin, but the pictures after only 29 days were incredible. He told me that the pain is all but gone throughout his body, especially his chest. That the depression bouts he dealt with were gone. His focus improved. It wasn’t about the weight loss, In fact, he hadn’t even added any exercise. He just felt…better. I can’t tell you how happy I am for him and his family. Sarah is cooking all kinds of new paleo recipes, and the girls are learning healthy habits they can carry into their future. I have just added the photo: 60 days Paleo, as an update! If you’re a Paleo Parent, I know from experience you’ve gone through this. People who don’t yet understand the Paleo lifestyle (or maybe even health in general) telling you that your kids “need a break” and you need to just “let the poor kid have some cake, geeezzz” or my all time overused favorite – “EVERYTHING is ok in moderation! !” Really? Would you give your children poison, drugs, or alcohol – even in moderation? We now know that exposure to gluten just once in a while starts the inflammation and healing cycle all over again. What about the girl who quit smoking? (This was me 10 months ago)…The support is overwhelming! “Wow, Cold turkey?? How’d you do it? Great job, good for you, way to go! !” There was a time that smoking and drinking were so commonplace and socially acceptable that almost everyone did it, and it was allowed everywhere. No one questioned it. Then, the health effects began becoming apparent, and the warnings were out. Over time, smoking became a health hazard and was banned inside airplanes, public buildings, etc. (I do remember people smoking in the mall…) More recently, the effects of second-hand smoke were revealed, and we found that everyone around the smoker was at risk, prompting further bans on even open-air smoking in public places. HOORAY for doing something right!!! So what is so different when someone makes a lifestyle change involving nutrition? I cut sugar and grains from my family’s diet and I get quite the opposite effect. “WHAT? Why would you do that to your poor kids? Or yourself for that matter? Cutting out a whole ‘food group’ is BAD for you! Well, what CAN you eat? Oh, relax and get off your DIET for one day! Just one can’t hurt!” I really think if I were diabetic or allergic to wheat products, the response would be so much different. I have a better question: Why on earth would I wait until I already have a disease to switch my diet? Why not avoid the diabetes in the first place? Why does that not make more sense?? I am not eliminating essential anything from my diet. I don’t know where the ‘food groups’ came from, but I do know there are 3 macronutrients: Protein, fat, and carbohydrate. I don’t cut any of those. I eat lots of protein, fat, and carbs. I just get mine from Grass fed animals, nuts, and organic veggies and fruit. I get so many carbs from veggies, in fact, that I am able to keep up my extremely tough work and kid schedule, AND workout 6 days a week (3 days of cardio), AND prep meals in advance. I have more focus and energy than I’ve ever had. What is it that me or my growing children are missing again? Sugar crashes, fatigue, cavities, illness, respiratory illness from inflammation? Yeah, keep it. I hope against hope to make a difference in the lives of families who desperately need it. Look around next time you’re in public. Over half of all Americans are at least 23 pounds overweight, and 33% are OBESE. Health is an issue. Dare to be different, to eat better, to take some flack, and know you’re doing what’s right for your family. I’m with you all the way! I am the oldest kid of thee CaveMomma, the first CaveKid! I’m writing this because my momma has noticed a bunch of complainers about how your kids wont eat the food you give them. REALLY?!?!?! I honestly am confuzzled. I like the food a lot. Except the spaghetti, I hate spaghetti,(even WITH noodles instead of squash) but that’s just me. The reason why I don’t freak out over the food is because I feel a lot healthier around my friends. Ever since I’ve been eating healthy I’ve noticed something. Whenever I eat corn, pizza, pancakes, or bread, my stomach hurts and its hard to sleep, so I usually I eat healthy around them and they sometimes do the same. What about the sugary foods? They don’t seem good at all to me. (but I do have a weekness for ice cream). That’s really all there is to say. Now you know what it’s like bein’ a CaveKid, not that bad. BUT what do I feed my KIDS??? If you have processed food in your house, it’s going to look like a better option to children (and adults) who haven’t switched their palates yet. Change is hard. But just like dealing with any addiction, you have to remove the temptation. In my house, you will NOT find a processed food. Not one. So, what DO we feed them? Well, I do give them choices. They help me meal plan for the week. We choose foods together. With 4 kids, they’re never going to like all the same things. So, we make concessions. They’re aware that they eat what’s on the table or they don’t eat- end of discussion. (NO, something isn’t always better than nothing. They won’t starve. They’ll eat when they’re hungry. The first time you give in, they’ll know the option is there if they wait long enough.) All that said, when they leave your home, they’ll have the choice to eat what’s available “out there”. The best thing we can do is remind them they have a choice, and to just take mental note of how they feel after eating junk food. For Breakfast: We do scrambled or hard-boiled eggs, or we do Everyday Paleo’s egg muffins.If we have extra time (on the weekends) we throw some bacon in the mix. This is also a place to get creative. We are just about the only country that separates our “breakfast food fare” from the rest of the day. You’d eat pizza for breakfast in the past, right? So grab some leftovers from last night’s pork or steak. There are so many options out there. Google some Primal/Paleo friendly breakfast foods, or, civilizedcavemancooking.com has a cereal and some pancake recipes that are amazing. Yes I COOK. That’s the WORK to which I was referring at the beginning. It takes about 5 more minutes than putting cereal on the table. Sometimes, my older 2 do it for/with me. It really isn’t too much extra. We have to be out the door by 6:30am, so, no excuses. Plus, If you boil the eggs, or make the “cereal’ or “pancakes” ahead of time, It’s grab and go. I pack their lunches every day. The kids do this with me the night before – and they choose what goes in (here’s another place where there are no bad choices.) Typical choices are: Rolled up Turkey or chicken (nitrate free, no fillers),baby carrots, broccoli slaw, celery and a side of almond butter and golden sugar-free raisins,or Romaine leaves with Chicken salad (see recipe on this blog). I also just found that for my son, who was obsessed with PBJ, if I make caveman pancakes, I can spread on some homemade almond butter and sliced or smashed strawberries and roll em up..lifesaver. My oldest loves green bell peppers and avocados. I know this because we experiment with different things and decide which things they like. This will also save me money, because I’m not buying a whole bunch of stuff that they unanimously hate. They really don’t miss the bread. It’s better when THEY choose because then it was their idea, not something I forced. I don’t feel like I am depriving them. Actually, I feel that’s what I was doing before. Now, I think they’ll get through their day full and focused. WIN! Dinner: Tacos on Romaine with homemade salsa; Crock pot pork tenderloin with Civilized Caveman BBQ sauce and sweet potatoes (My babies LOVE sweet ‘taters! ), Spaghetti (made with ground turkey, or grass-fed ground beef, or bison) served over spaghetti squash, White chicken chili soup, (see my recipe!) the list goes on. This food is cheap to make (see my previous blog), easy to pre-make and reuse for the week, and MUCH tastier than that flavorless processed junk .I have actually found that without all that extra bread/wraps/etc you can actually TASTE THE FOOD. Take all the money you’re saving by not buying bread, cereal, pasta, and the like, and use it toward upgrading your cuts of meat and organic produce. Snacks are Fruits, cut up veggies, Paleo-treats like cinnamon apple bars and apple flowers with almond butter dip. Smoothies – you can throw in a handful of spinach and they’ll never know the difference, especially if you’re using coconut milk and fruit. Really, When I first heard that I was like “GROOOOSSSS!” but I tried it today post workout, and it was DELISH! This can also be used at breakfast if you’re going to put a protein with it. 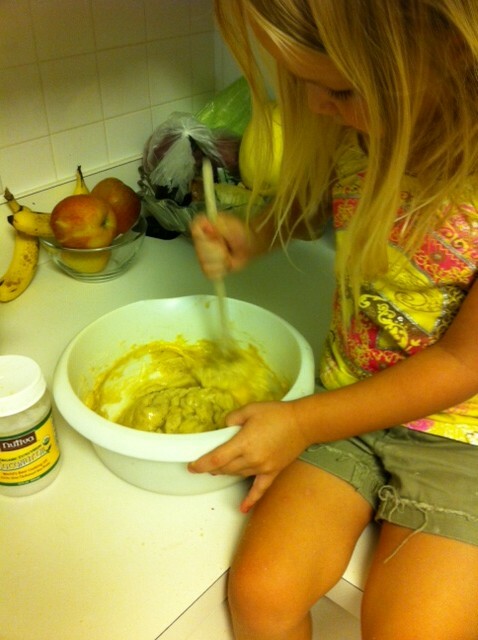 I will be having the kiddos help me this week posting Kid-friendly recipes they come up with now that summer break is here. I would also suggest checking out EverydayPaleo.com (she is my HERO) and also fastpaleo.com and civilizedcavemancooking.com, which are some of the best recipe sites on the web. Please Subscribe to this blog, and post questions and comments. I promise to answer as many as I can. It’s my goal to help as many new Paleo families as I can reach! If you wish, please also share my blog with any other busy people who you think would benefit. Thanks so much for visiting!! From major critic to loving the Paleo life.. I don’t have TIME to eat healthy…. Now, I understand that there are always going to be times when there really isn’t enough time or things come up, I understand and fully support that. For all the other times the biggest solution is to just plan ahead. I am such a huge fan of so many amazing people in the Paleo community that awe me with their dedication and drive to keep themselves and their families healthy and they manage to do it with a wide array of circumstances. Let’s start with the author of this blog post, Cavemomma. She is rocking out with a family of 6 and making it happen cheaper than she did with processed $H!T. (I would also interject: I own and operate a full-time business, go to Nursing school full-time in the evenings Aug-May, and work out 6 days.) My awesome pal Nom Nom Paleo who is a mother, wife, and works the graveyard shift and has time to blog every second of her meal journeys while getting her children to help her cook. Next one I am sure everyone knows is the awesome Sarah Fragoso from Everyday Paleo who is also a mother, wife, trainer, and Paleo goddess. I could continue to rock this list out until you are blogged out and your vision has deteriorated from the repetitive reading. Only reason I listed all these people is because, they all have 2 things in common: They wish there were 28 hours in the day to get everything done they need to everyday, and they all make a plan for their meals, shopping, cooking, etc. and stick to it. I am not saying you have to get all extreme couponers on it, but writing something down sub-consciously forces you to stick to it and helps you avoid those drive thrus and take out menus. Here is my recipe for success whether you are single, married, or driving the Duggar bus to the grocery store with your 19 kids and counting. Look at your overly busy schedule and set a block of time to sit down and do a meal plan for the week, that’s right – you have to sit down and plan at least 27 delicious meals that you actually have to cook (this is my favorite part). In all actuality, this normally ends up being more like 15 meals with lots of leftovers and easy to go breakfasts so don’t let that number intimidate you. From your meal plan, make a grocery list and separate it from where you are going to get it, i.e. meat already in your freezer, farmers markets, etc. Making a list and forcing yourself to stick to it alone will save you TONS of money and time. You won’t waste those precious minutes aimlessly aisle wandering putting no good shelf shopping junk in your cart. Cavemomma int – if you have kids with you, they can hold your list and remind you as you remind them we have to stick to the list. In our budget, I only bring enough cash to cover what we have on the list. I’ve done this enough times to know how much I need. It takes some time, but budgeting is crucial. I hope someone is still reading at this point, you learned something or could take something out of this, and most of all that you will continue to strive to live a healthy lifestyle and spread that wealth to the world. It only takes 1 to make a difference and by staying positive and being supportive of anyone’s interests in a positive lifestyle change we can touch so many lives in such a positive way. Stay healthy, keep spreading Paleo love, and keep it simple. Your body (and your children’s bodies) will thank you. Thank you as always for visiting. PLEASE ASK ME QUESTIONS. THAT’S WHY I’M HERE!! This is a touchy subject I meet every day. How are we supposed to feed our family healthy food? It’s sooooo expensive to eat like that..I always wonder: how much of that is what you’ve heard, and accepted, and how much is research? Most people see the price of organics and just say “too much” and move on to the Hamburger Helper and Cola aisles. Oi Vey. Our bodies and our children deserve better. As most of you are aware, I have children, so we feed a family of six. I own a cleaning company. Not a stock brokerage, a cleaning company. Our family doesn’t believe in debt, so we save every penny and buy only what we need and can afford in cash. I tell you all of that to tell you this: I feed this family the same way I feed myself. It’s not “mom’s on a diet, this is my food, you eat that garbage”. My passion is teaching children habits that they’ll take with them into the future. It’s about spending a little more now, if needed, to not pay huge healthcare costs. Our immune systems are better than 95% of all our peers, and our future is not going to be full of medication and dr. visits. It’ll be full of outdoor playtime. Because we make great choices now. I went to the grocery store this weekend, just after a debate on Facebook about the so-called “high cost” of feeding a family healthy food. I walked around the store looking at all the processed crap that I literally haven’t laid eyes on in quite some time. I was expecting to have a real fight on my hands. I don’t. One pound of bananas was 54 cents (on sale, normally .69). Frosted Flakes were 3.99 per box. Free range organic eggs were 2.69 per dozen. (Frosted flakes surges blood sugar, and leaves kids hungry in about an hour. Eggs have healthy protein, fats, and vitamins to fuel the brain, and leaves kids and adults satiated for hours.) Sweet potatoes were $1 each for HUGE potatoes (I fed three of us on ONE tonight.) Organic Romaine was 3.99 for a pack of 3 stalks, and Organic baby spinach was 4.19 for a giant box. Conversely, One Digiorno Pizza and cookies in a box (enough to feed 2-3 of most of us) was $8.19 Um, gross. I got a whole Pork Tenderloin (fed 6) for 7.99. I bought 24 distilled waters for 2.99. How much was that 12 pack of coke again? I made a crockpot full of pulled port tenderloin, sweet potatoes, and fresh picked green beans for $11.89 this evening. There are enough leftovers for David and I to have for lunch tomorrow. That’s 2 meals for $11.89. But the poor kids!!! Yeah, cuz their poor little pancreas and livers are screaming “I need a pop tart! Chicken nuggets too!” Not likely. I made a salad today for the two of us from 1/2 organic romaine stalk, a handful of spinach, organic tomato, avocado, and olive oil with half a chicken breast. In my estimation, it cost about 5.00 for lunch for the two of us. I challenge you to take $5 to your local fast food restaurant and attempt to feed two people…then also factor in those blood pressure pills you’re going to be on after eating like that for a week. I used to feed my family the same “cheap” grocery store food. When I switched to Primal, I spent a bunch. Then I realized that I had to simply plan better. So, after making a meal plan (breakfast, lunch, dinner, snacks) for 7 days, I set out for the grocery store. I spent exactly $11 more than the budget we’d set before, that I had been keeping with the sugar-filled, processed, gluten-laden, JUNK. While standing in line, I got up the courage to ask the lady in front of me how many people she was buying groceries for. She said 2, herself and her husband, and that her grandbaby comes over twice a week. She had the usual: Soda, bread, hamburger, buns, Cereal, yogurt, spaghetti sauce and noodles, mac and cheese, etc.I asked if it was for the whole week, and she said yes, do you think it’s enough? (insert bitten tongue here)…Her total for 2 people + 1/2 was $89.94. WTFREAK?? My total for the week for 6 people was $129. .This is where I also decided to make a couple of sacrifices in other areas to make up for the extra $11…Because this ‘temple’ and my children are worth it. Every. time. Posted in Random Rants, Recipes.